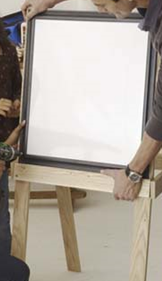 How To Build an Art Easel | KaBOOM! 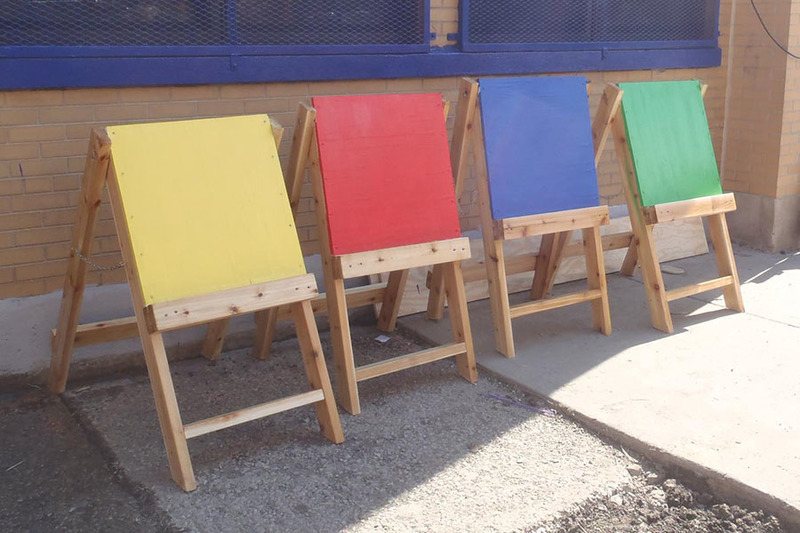 Encourage creativity by giving playspace visitors a place to draw, paint, and create! Take  of the 1x3x8' boards. Cut each into  1x3x48" pieces, for a total of  1x3x48" pieces. Take the remaining 1x3x8' board. Cut into  1x3x24" pieces and  1x3x14" pieces. Take the 2x4' marker board. Cut out  23"x23" marker board pieces. 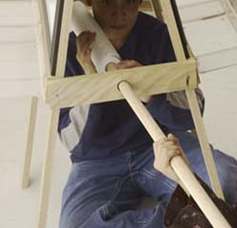 Take the 1"x48" dowel. Cut it down to a 1"x36" dowel piece. Take the  1x3x14" pieces that you have already cut. Measure ¾" in from one of the 3" ends and create a pilot hole. Use a jig saw to cut out a ⅛"-wide slot. Before building, inventory and sort all of your materials. Start by lining up  of the 1x3x48" pieces end to end. These will be the legs of your easel. Lay a strap hinge across the butted ends, allowing space for the hinge knuckles. Attach the hinge with ¾" screws. Repeat this for the other pair of legs. Stand both sets of legs up, placing the sets about 2' apart from each other. Find the midpoint of each leg by measuring up (or down!) 24". 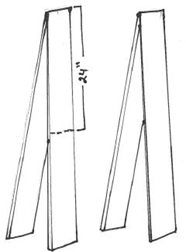 Line up a 24" cross-brace across the face of the legs so that the ends are flush with the outer edges of the legs. 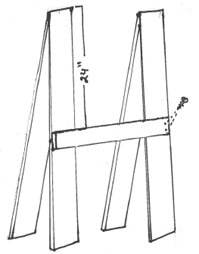 The top of the cross-brace should be at the midpoint mark. Repeat step 3 on the other side of the easel. Attach the 1 ¼" hole saw attachment to your drill. Find the center of each 1x3x14" piece (2 pieces per easel.) Use the hole saw attachment to cut out a circle in the exact center of each piece. Take the 14" side brackets and measure ¾" in from the opposite side of the slot. Use the ¼" drill bit to pilot a hole centered on this ¾" line. 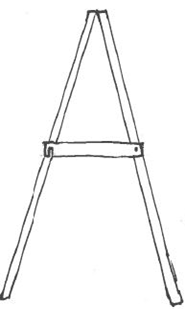 Spread the easel legs so that the side brackets are flush with the ends of the cross braces. Insert a 1 ¼" screw through the small pilot hole. Place a washer on the screw, and then drive the screw into the leg of the easel. (The washer should be sandwiched between the left and side bracket.) Make sure the screw is loose enough that it can pivot. This will ensure that the easel legs can be adjusted. 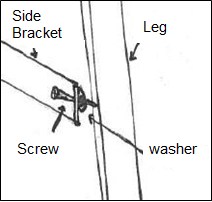 Drive a screw directly into the opposite leg and leave about ¾" of the screw sticking out - the slot on the side bracket should slide over this screw. Attach the side bracket on the opposite leg. Position a piece of marker board over the legs, with its bottom aligned with the top of the cross brace. Use a ⅛" drill bit to pilot holes into the four corners of the board and into the legs. Attach the board through these holes using the 1 ¼" screws. Slide the dowel through the hole in one side bracket, through the paper roll, and out the other side.